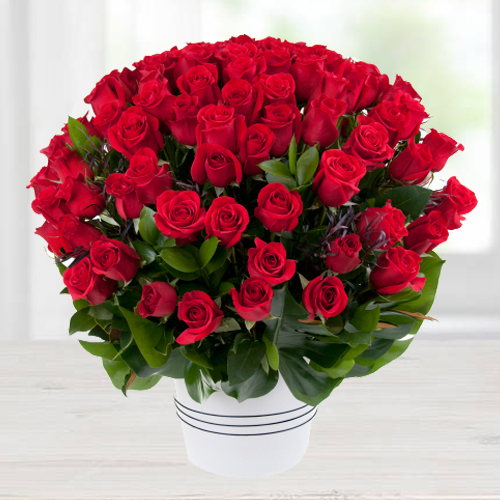 Pamper your loved ones by sending them this Luxurious Valley of 100 Dutch Red Roses Bouquet exclusively meant to convey your wishes in the best manner. 100 Exclusive Red Dutch Red Roses Arrangement with Assorted Cadburys Chocolate. Red Dutch Roses Arrangement with Three Colourful Balloons, Teddy. 100 Exclusive Red Dutch Red Roses Arrangement with 500grms Assorted Sweets. 100 Exclusive Red Dutch Red Roses Arrangement with 16 pcs Ferrero Rocher chocolate box.